By Design, or By Chance? I was just about to leave when Lawrence stuck his hand in the air. “What about the people?” he asked. “But, it’s not my fault. I have only been a manager here for two months.” Lawrence was backpedaling big time. “And so, for the past two months, you have supported a system by doing nothing about it,” I replied. Lawrence was looking for a better excuse, but I stopped him. “Look, in the short time you have been a manager, have you drawn a brief diagram about how people work around here, how they relate to each other, how they depend on each other? Have you written job profiles to document the specific accountabilities of each person on the floor? 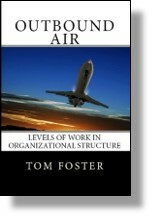 This entry was posted in Organization Structure and tagged organizational structure, people system on August 22, 2018 by Tom Foster.